Three companies have agreed to enter Mtech's new Tech Entrepreneur Research and Prototyping (TERP) Startup Laboratory, a program designed for entrepreneurs who need a place to quickly develop technology prototypes and get some help in starting their companies. The new TERP Startup Lab companies include Coil Guitars, SD Nanosciences, and Tseai Energy Unlimited. Founded in 2006 by Bruce Jacob, Keystone Professor and director of computer engineering in the department of electrical and computer engineering, Coil Guitar's mission is to design high-fidelity audio circuits for electric guitars and basses that enable a maximum degree of tone shaping with a minimum number of controls. In early 2009, Coil received a Maryland Industrial Partnerships (MIPS) project award to further develop its technologies in collaboration with university researchers. The company also involves undergraduates in audio systems research and donates equipment for an electric-guitar design course. SD Nanosciences, a company co-founded by cell biology and molecular genetics professor Dan Stein and chemistry and biochemistry professor Philip DeShong, utilizes breakthroughs in nanotechnology to develop biotechnological applications for pathogen detection, cancer screening, vaccines, and drug delivery. Tseai Energy Unlimited (TSU), winner of $10K in the undergraduate division and winner of a $15K Warren Citrin Social Impact Award in the University of Maryland $75K Business Plan Competition, is developing a system to provide sustainable electricity to rural communities in the developing world and help improve the quality of life in those communities. The company plans to design and build micro-power plants using renewable energy sources, while also establishing food processing plants, based on a community's local agriculture, to provide biofuel materials and other food-based products. TSU was founded by Trevor Young, a student in Mtech's Hillman Entrepreneurs Program. 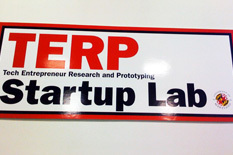 For more information about the TERP Startup Lab, visit www.startuplab.umd.edu.